Did you know that someone could read your credit cards, passport, and other sensitive information without actually having to swipe them or look at them? Unfortunately, RFID (Radio Frequency IDentification) technology used to track sensitive data in many of today’s portable identifiers (e.g. credit cards) can be easily scanned without you ever knowing. The extent of this security problem is only just becoming apparent. Well now you can help guard against identity theft with the RFIDGuard Active Card. The remarkable technology within RFIDGuard Active Card has been developed in the USA by advisors to the Crime Prevention Program. It works by first sensing the approach of RFID readers and/or scanners. Once a threat is detected RFIDGuard creates a 90mm e-field (electronic field) to jam and scramble your RFID chip signal which protects your personal information from hackers. RFIDGuard Active Card is battery free! It is actually powered by the very devices that threaten to hack (steal) your credit cards and/or personal data. 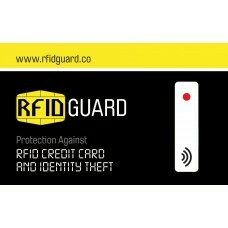 • RFIDGuard patented LED red indicator is your guarantee the card is guarding your credit card and identity details..